Kristen Anderson, former Assistant Principal of Cawston Elementary School, was promoted to Principal of Dartmouth Middle School at the Board meeting on May 15th. She replaced Dr. Jennifer Martin, who was recently promoted to Director of Special Education. Mrs. Anderson is beginning her 14th year in education and at Hemet Unified School District. Her first job within the district was at Ramona Elementary School where she use to be a student. Anderson received her Bachelor of Arts degree and her teaching credentials at California Baptist University and her Masters from National University. Anderson said she is excited about the transition from elementary to middle school. She said during middle school students begin to discover who they are, what they want to do, and they begin to take ownership in their education. 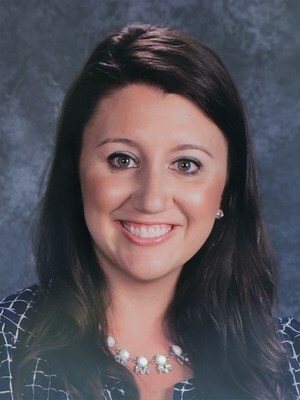 In an effort to help students academically and social-emotionally, she will collaborate with her new team and focus on ways to support the whole child. Anderson said she is excited to join the Dartmouth team and feels honored to be a part of an AVID Demonstration School. She is looking forward to continuing to implement strategies to support students as they become college and career ready. Anderson said she is excited to help build upon what makes Dartmouth great. She said she will be using her first year to understand the context of the Dartmouth campus and create relationships with students, families and staff. Anderson said she will be highly visible on campus and will have an open-door policy. She stated that having the open-door policy will allow her to work with all stakeholders to create solutions that will have a positive impact on the Dartmouth community. “I want to be a resource and support to all students, families and staff,” said Anderson, “I want to empower parents with knowledge on how they can support their children and create an environment where students feel safe and are provided the necessary tools they need to succeed.